“I’m the last living founding member of Jax Woodworkers. All the others have passed away. I’ve been the Chaplin for many years,” Bobby Clayton said. 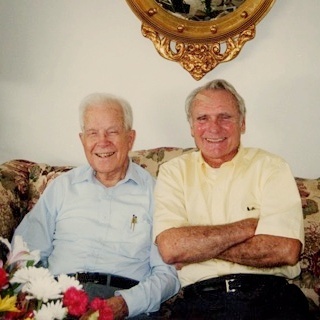 Woodrow Connors with Bobby Clayton, two of the four original founders of Jax Woodworkers Club. “My neighbor, Woodrow Connors, had a two-car detached garage in his back yard. That’s where he had all his woodworking equipment. When we moved into the neighborhood, he had been living there several years before us. This is where Woodrow founded the club. I’ve been there ever since the beginning, since the inception. Jax Woodworkers formed with four men, including me. Carmen Fenanelli was a banker and became the treasurer right away. And Ray Reynolds was the other guy. He made a bunch of grandfather clocks and walking canes, plus many, many, many toys over the years. We’re considered to be the founders. But Woodrow was the man, the head man. It started a long time ago,” Bobby said. Jax Woodworkers started in December 1989 in Woodrow’s garage. 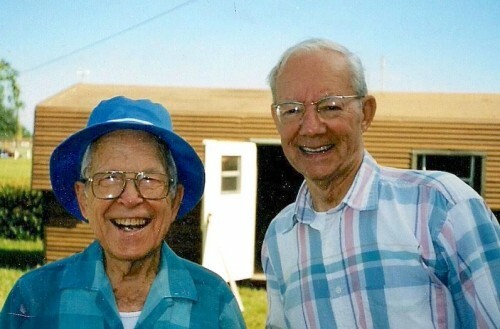 Woodrow Connors with Ray Reynolds, two of the four founders of Jax Woodworkers Club. 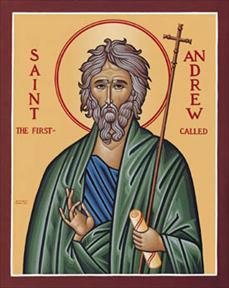 “Woodrow was already making the crosses. They were designed to be hung in rear-view mirrors inside cars. He brought the idea from the North Jacksonville Baptist Church. He was a member of that church and that’s where he got the idea. He started making crosses in his garage. Each one is made of hardwood. They all have red yarn and a heart that holds the yarn together. His wife, Miriam, used to string the red yarn through the crosses and add the plastic hearts. The crosses were free and not to be sold. He just gave them away. Woodrow made more than 20,000 crosses and today they’re probably all over the world,” Bobby said. 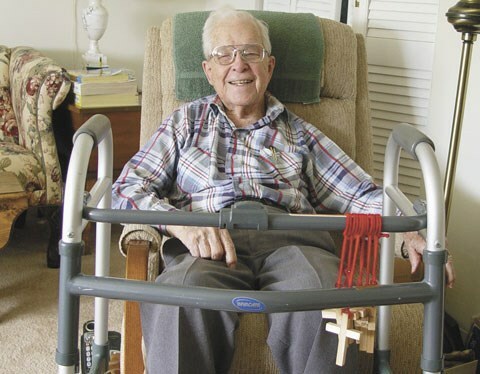 Miriam helped her husband, Woodrow Connors, by stringing red yarn through crosses that he gave away for free. “I have a wood shop in my garage too. I put all my equipment on wheels. When I want to work, I roll everything out in the back and work on it,” Bobby said. “Woodrow founded the club in his back yard. That’s where we started making toys. I’d walk over there. I was just one of the guys who was helping to get it started. We started with four guys. It grew to 60 plus members. We made thousands of toys and we’d give them all away. None of them are for sale. They’re for small children,” Bobby said. “We’ve met at different places. We’ve moved around to anyplace that would have us. Now we’re meeting at St. Catherine’s Episcopal Church. We meet on the third Saturday of each month at noon. We eat in the church dining room before we start the meeting. The workers from the church fix us lunch,” Bobby said. “The president always starts the meeting with a prayer and the pledge of allegiance. That’s important, the prayer part. Make sure you put that down. The secretary reads the minutes from the past meeting. Then the safety officer gives a safety report. Working with saws can be very dangerous, especially with small projects. He reads and speaks from his own personal experience. You don’t put thin plywood in a planer, for example. If you do it will fire bullets. This is just an example. You should never plane a piece of plywood,” Bobby said. “On the third Saturday of November each year, all the members bring in the toys for distribution. Some of the toys go to Shriners. There are about fifteen agencies that come to pick up the toys during the pick-up time. We divide them between the groups. Some people take them to the hospitals and give them away,” Bobby said. Jax Woodworkers club members lay out all the wood toys to prepare for pick up. 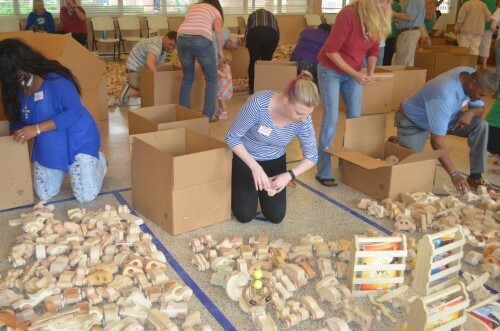 “The members of Jax Woodworkers make about 5,000 toys a year. In November, we spread the toys out all over the floor. People come with boxes to get the toys. They go fast,” Bobby said. “One of the club’s biggest expenses is wheels. The wheels are expensive. The toy chairman orders wheels and axles with money collected from annual membership dues,” Bobby said. Jax Woodworkers Club purchases the majority of their wheels from Woodworks. 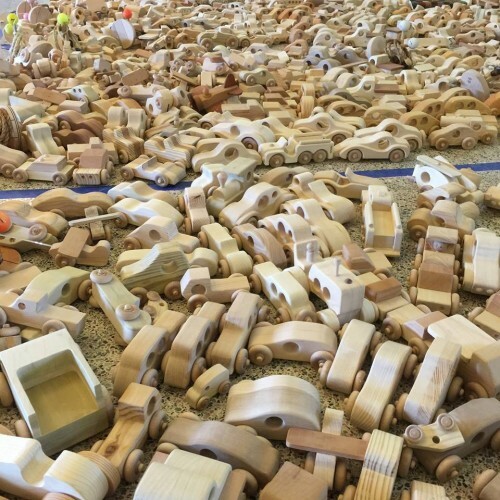 Jax Woodworkers members prepare thousands of handmade toy cars, trucks, planes and other wood toys for their annual giveaway. “Every year we make thousands of toys for the various agencies The American Legion, Sulzbacher Center. Some of them I never heard of before, such as a group for babies of prisoners,” Bobby said. Jax Woodworkers lay out all the toys for distribution each November for various nonprofits to come pick them up. “The people who receive these toys are invited back from last year to this year and they tell about giving them away. When the children go into the room with plastic toys and wooden toys, they always run to the wooden toys. People get up with tears in their eyes to tell what a joy it is to get the toys. The men are humble. 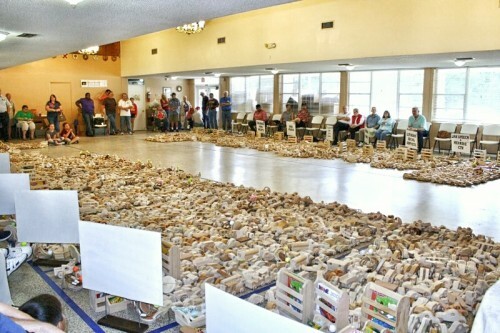 When you lay 5,000 toys out on the floor, it’s quite a sight. The woodworkers don’t want any credit. They’re just doing the work of the Lord,” Bobby said. 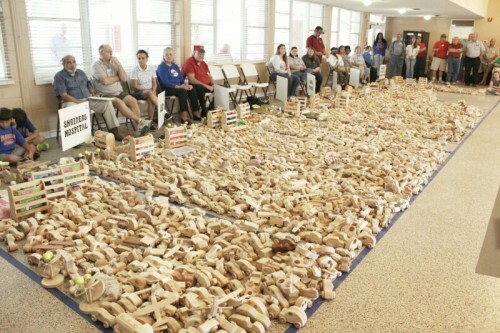 Jax Woodworkers Club gives away thousands of handmade wood toys each year. “The woodworkers have such great camaraderie. They’re not trying to outdo the other ones. They’re just trying to do something for the children,” Bobby said. “One of the main places we get our wood is Rulon in St. Augustine. They supply us with wood. They’re in the business of making ceilings and wall systems for properties all over the world. 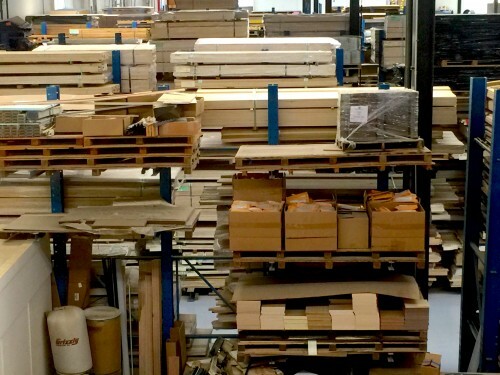 We’ve developed a relationship with Rulon to get their wood. So we get choice wood, quite often poplar and black walnut. Rulon makes fancy commercial ceilings,” Bobby said. “One of our members, Greg Fisher, found out about Rulon from a friend who was getting wood from them. Greg went to see Rulon to tell them what Jax Woodworkers Club does and our need for any wood they could give us. Rulon was happy to give us wood to make toys for needy children. They have been doing this now for over six years. Each meeting there is a pickup truck full of wood for our members donated by Rulon,” said Web Master Bob Corona. Rulon International is committed to giving back to the community. They have been donating wood to Jax Woodworkers Club since 2010. “I like this club because it gives us an opportunity to be of service to the Lord to see the children light up when we give them a toy. Aside from that, I personally enjoy getting a hold of a plan, making the toys, and sharing ideas on how to make different ones,” Bobby said. “The woodworkers also build a lot of stuff for show-n-tell that’s not given away. We have show-n-tell at every meeting except December when we have our Christmas party. The callers make the calls to remind people about the meetings a few days before,” Bobby said. “Making toys is our main goal, but at each meeting we do show-n-tell. The show-n-tell officer chooses a topic such as drill press or table saw . They’ll bring stuff in that they made with this equipment. We have a table full of stuff that has nothing to do with giveaway toys. Some guys come in with cabinets they’ve built or airplanes. We take it in and show it. You leave your name by your piece and someone will call you up to explain how you made it. And then people ask questions like, ‘what kind of glue did you use’ and so on,” Bobby said. 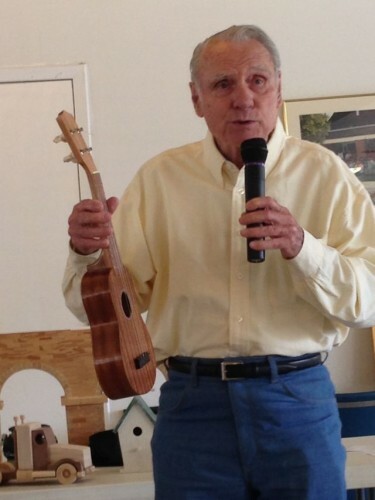 Bobby Clayton at Jax Woodworkers March 2014 meeting during show-n-tell, describing how he made this ukulele. “I made a ukulele once. I brought it in and showed it and played it. I’ve brought clocks in and showed them. I’ve probably made about twenty different clocks, one big grandfather clock. We have three grandfather clocks in our house. My father had an old clock made in Mississippi. it’s a little over three feet high. That’s what got me interested in clocks,” Bobby said. “A few years ago a gentleman called the Jax Woodworkers Club to find out if anyone would be interested in purchasing a grandfather clock kit that his father purchased in 1991 from the Wisconsin Clock Company. That same year his father passed away leaving the kit in limbo for nine years. I negotiated a price that included all the basic parts including the movement and, to my surprise, a nine-tube striking system. I didn’t keep a record of how long it took to complete the project, but I would estimate between six to nine months, of course, part time,” Bobby said. 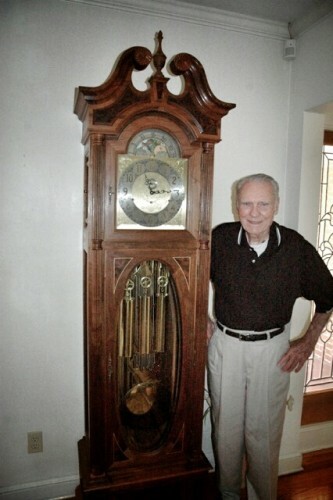 Bobby Clayton has a number of clocks chiming every quarter hour throughout his home. This grandfather clock that he built from a kit, is the largest of his collection. “Sawdust Trails can be any Saturday of the month except during our monthly meeting. A member will host a gathering at their home. These events usually have about fifteen to twenty people. People volunteer and invite people to come to their house for breakfast on Saturday. This gives the other members a chance to see their workshop and learn something. We call this Sawdust Trails,” Bobby said. 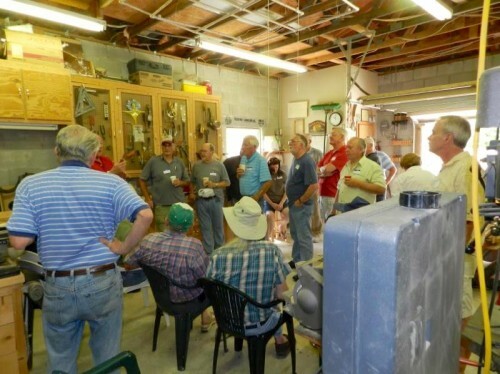 Jax Woodworkers Club members at Jim and Wilma Naylor’s Sawdust Trail gathering in March, 2016. “In December we have a Christmas party. People dress up in costumes. If you want to bring a gift, you can. If you do, then you get a ticket and pick a gift that looks attractive. It’s fun. We sing Christmas carols. All the wives are invited and many of them come. There are mostly men who do the woodworking, but some women do too,” Bobby said. “Margaret Miller was the president for years. She kept us together. She stepped down to let others have a chance. She’s a woodworker. She makes some pretty good stuff. We have a mission statement, by-laws, and a full slate of elected officers,” Bobby said. 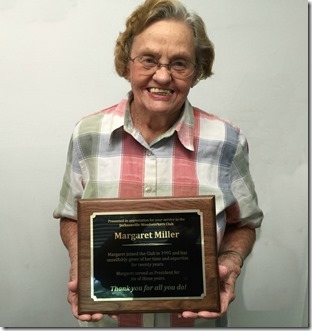 Margaret Miller holding an award she received in recognition for all her years of leading Jax Woodworkers Club. The plaque was presented to her at the club’s June 2015 meeting. 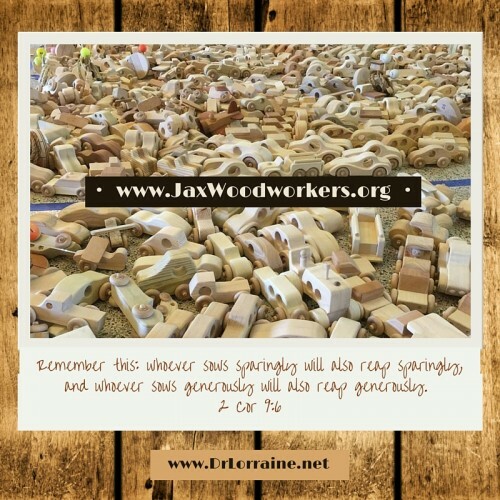 “We need help to get the word out there about Jax Woodworkers. Our club has many elderly members and young people are more into technology, so getting new members is difficult. I was president for six years. It was an honor and a privilege to be part of this great organization who, for over 25 years, have worked hours and hours to see to it needy children receive toys at Christmas. These members with beautiful hearts are a gift to the community,” said Margaret Miller. Woodrow Connors went to join his Maker in Heaven on February 6, 2009. He was 95 years old. But this hasn’t stopped Jax Woodworkers from carrying out Woodrow’s vision of making more and more toys each year. Woodrow Connors has made, and given away, more than 20,000 of these crosses. He gave them away for free everywhere he went. “The Gospel is free. Jesus didn’t charge anything. How can I?” he said. “Woodrow wanted to expand the club. There’s another woodworkers club in Jacksonville at Woodcraft. They sell woodworking equipment and wood. There are many woodworking clubs all over the country. If you look up woodworkers, you can find many of them out there,” Bobby said. “I truly appreciate my daughter, Lorraine Haataia, and the work she did to pull this story together,” Bobby said. This looks good. The club has a place in my heart. Woody recruited me back in the beginning, and I look forward to the meetings Reading this gives me a warm feeling in my heart. Thank You Laura Ashley long time member. Thank you for sending me the link that allowed me to read this wonderful story. Bobby Clayton bowls with me on Monday afternoons along with his beautiful wife Esther. It is a pleasure to share time with them every Monday. Congratulations to Bobby and Happy Birthday to Esther. What a lovely article! I’m Woodrow and Miriam’s granddaughter, and this story made me so very proud and happy. It would have made them happy, too. Granddad built many handcrafted toys for my three children – a personalized replica of a Navy destroyer dedicated to the year his first great-grandson was born, doll strollers, doll beds, cars, an amazing three piece red train – caboose and all – and a shoe shine kit for my son. In addition to these treasures, he created a beautiful wooden bowl in which my husband still puts his wallet, keys, etc., every day, as well as a shoe shine box, and a large tool chest. For me, there was an oil lamp and stand, a mirror, and a step stool for my kitchen. All of the above involved complex design, intricate woodworking skills, and lots of love. My Mimi (Miriam) sewed the doll clothes, doll bed mattresses and linens, and enormous floppy-eared Easter bunnies – complete with multiple outfits. She loved making things for her family – and she adored her Woodrow. 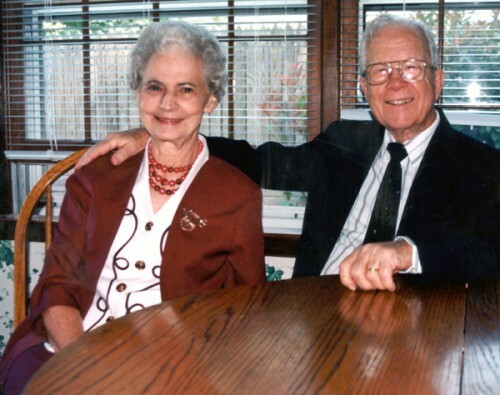 Woodrow and Miriam passed along to their family their creative gifts and skills and, most importantly, their love of the Lord. My father, Tracy, is a gifted woodworker, and continues to teach me a skill that I believe that somehow – through generations of woodworkers – runs in my veins. They were a special couple; always laughing, praying, and both loved a good pun. Thank you for taking the time to honor the selfless men and women who work so hard to bring joy to young children. I wish I lived closer so I could be a part of the special organization that my grandparents loved so very much. I miss them both. Thank you for bringing them back to me, even if just for a little while. Great bunch of guys and gals, proud to be a member of Jaxs Woodworkers and a friend of Bobbys. Everyone is very generous with both there time and skills. The toy go to great organizations, that see that there given to those in need.